The Triton II Autocut Bridge Saw is the ultimate blend of technology and performance. From the moment the 10" color touchscreen comes to life, you'll understand what this means. The well thought-out operator interface is designed to guide fabricators through all the functions with ease. 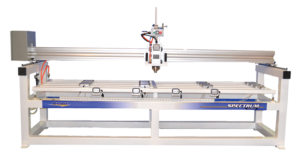 Features like the easy to use Autocut programming and the Quickcut auto positioning system help the operator increase production while minimizing mistakes. 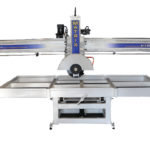 If you're considering a high-end auto-cutting saw for your fabrication needs, then the Triton II is the saw for you! Precise up/down control with brake. Water through spindle and external water supply for dust free operation. Versatile vacuum cup work holding system with backsplash support. 3 point adjustable work surface. Compatible with most bridge saws and made with the same high quality standards you've come to know from Matrix. Sold direct from us to you with no strings attached, the Hydraulic Tilt Table will cut the mess out of your operation. 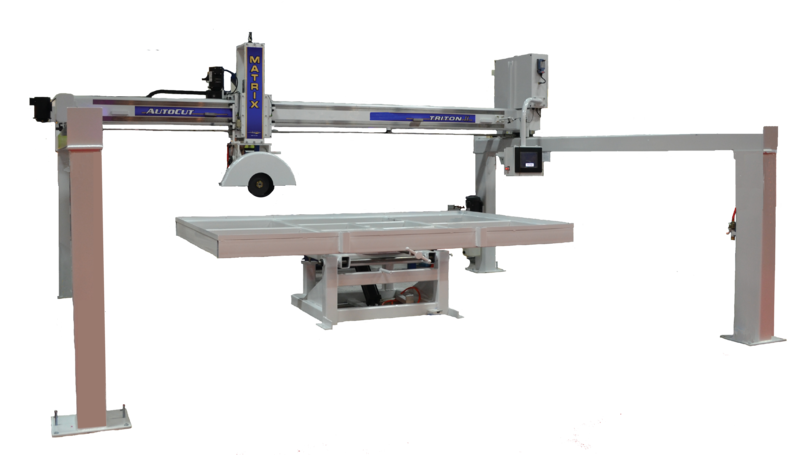 The Vision Bridge Saw from Matrix Machine Corp. is a no-mess, no-nonsense easy to use, entry level bridge saw built with the same quality that makes the Matrix line of bridge saws so popular among fabricators. 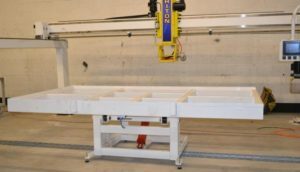 Matrix FORTY/FIVE Miter Saw is the best way to get straight accurate miter cuts in marble and granite. Its 10hp direct drive Italian sawing motor and variable speed control allows the operator to adjust speeds and feeds to all material types. Its simple design and integrated pneumatic clamping system ensure set up is fast, easy and efficient.